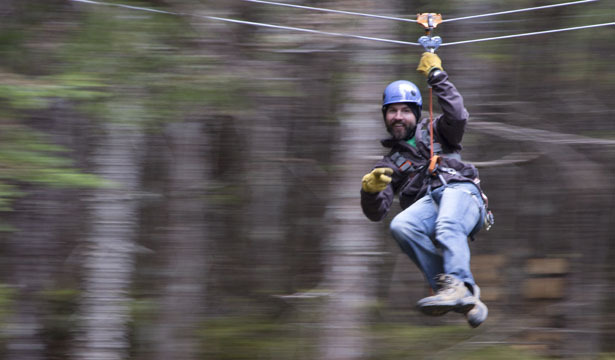 Get your thrills amidst the treetops as you thrill to Southest Alaska's most exciting zipline adventure. With 11 ziplines, four suspension bridges, and incredible drops over waterfalls and remote rainforest, this Skagway tour is for those with an unquenchable thirst for adrenaline. Your tour includes transportation to and from Skagway, and a Unimog ride to the top fo our custom-built zipline course that features a 750-foot long zip and a high-speed line that lets you achieve speeds up to 45 miles per hour - IF YOU DARE! A brake system allows you to control your own speed on the zips. Round-trip transportation provided, and you must be between 50 and 265 lbs. Minimum age is 6 yrs. This Skagway tour is designed for persons in good physical condition. If you are burdened with existing injuries, seizure disorders, and/or current or re-occurring medical conditions, of if you are pregnant, you should not take this tour.